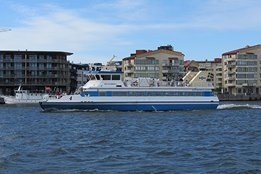 Gothenburg is set to convert a ferry to all-electric power as part of its ElectriCity project. Volvo Penta, who will provide the electric marine propulsion system, say they will be converting the vessel Älvsnabben 4 in a project set to get underway early next year. The ferry is then expected to enter commercial service on the Göta river by the end of 2020. "It will be the first fully-electric ferry in the city able to complete longer, multi-stop routes along the river, and ultimately incorporate quick charging capabilities," the company explains. Initially, the ferry will be charged overnight. Swedish public transport agency Västtrafik says the move is part of its aim to reduce CO2 emissions by 90% before 2035. The news comes amid a growing number of players looking to make battery-powered vessels a reality, aspirations that last week even saw plans unveiled for a zero emissions bunker tanker to enter into operation next year in the Tokyo Bay area.